Indiana Grand Racing and Casino will host a Job Fair on Monday, February 18. SHELBYVILLE, IN—FEBRUARY 12—Indiana Grand Racing and Casino is gearing up for the 17th season of Thoroughbred and Quarter Horse racing, which returns Tuesday, April 16, 2019. Along with the return of horses on the property is the return of numerous jobs throughout the facility to complement the racing program. To help fill some of these positions, the Human Resources team at Indiana Grand is holding a Job Fair Monday, Feb. 18, 2019. The event will be held from 12 until 3p.m. on the lower level of the grandstand in the first floor OTB. This area is accessible for all ages of potential team members, including those under 21 years of age. Free parking is available in the garage or in the surface parking lots with shuttle service provided directly to the doors of the racing building from the surface parking areas. "We are excited to get numerous positions filled at Indiana Grand," said Jennifer Hudon-Terrell, human resources development manager. "Our annual Job Fair gives us the opportunity to meet so many amazing people in the area and it also gives us a chance to share what a great company we have. It is truly a family and a wonderful place to be employed." On-site interviews by hiring managers will be conducted during the Job Fair for the following openings in food and beverage: servers, cooks, bartenders, bussing personnel; and barbacks. Other departments that will have representation for available positions including mutuel tellers, trackside maintenance, trackside security, trackside laborer, equine facility EVS, cage cashier, revenue audit, count room, security, guest services and EVS. Many of the positions are available to those 18 years of age and older with some restrictions of 21 and over placed on specific jobs in the casino. "The Job Fair is a great opportunity for our company to expand our work force," said Ron Baumann, senior vice president and general manager at Indiana Grand. "Because of our parent property, Caesars Entertainment, we are able to offer numerous options for benefits, bonuses and perks, something that is unique to our team members. And, the possibilities for moving up in our company are endless as we have properties worldwide in the gaming, racing, dining and entertainment industries." 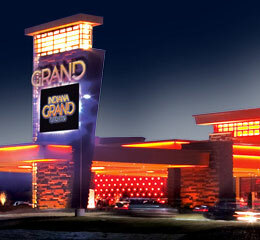 Indiana Grand is offering full time, part-time and seasonal positions. The company provides a wide range of benefits, including 401k, medical, optical, and dental packages along with paid time off for both full time and part-time team members. The facility offers an on-site wellness clinic and team member dining room at a minimal cost. In addition, educational assistance, partner discounts, and development training are available, which is just a sampling of privileges supported by the company. Indiana Grand is also part of the rich Total Returns program through Caesars Entertainment, giving all team members supplemental opportunities to receive merchandise, travel and other services at deep discounts. For more information on the upcoming job fair at Indiana Grand, go to the website at www.IndianaGrand.com and click on careers.